We decided to add a new greeting card to our collection for the summer season. As this time of year is most popular for weddings, we wanted to bring some Wildean wit to the party. We had always eyed using one the illustrations from our pocket guide, Romping through Dorian Gray together with one of Oscar Wilde’s witticisms. In the chapter, “The one with the Love Triangle”. Dorian Gray is whisked away to the theatre by admirer Lord Henry in his private carriage, leaving Basil Hallward, the painter of Dorian’s portrait to find his own way there – I am so sorry… there is only room for two. Read on to find out more about the Making of the Wilde Wedding Card. Romping through Dorian Gray literary guide by At it Again! The process to come up with the finished design took longer than expected under a tight deadline. Initially we decided to simply do a colour version of the original illustration from the pocket guide but felt that there was a better version out there. We decided to play around with the composition, shifting the Basil character to one side to put the focus on Dorian and Lord Henry taking off in the carriage. 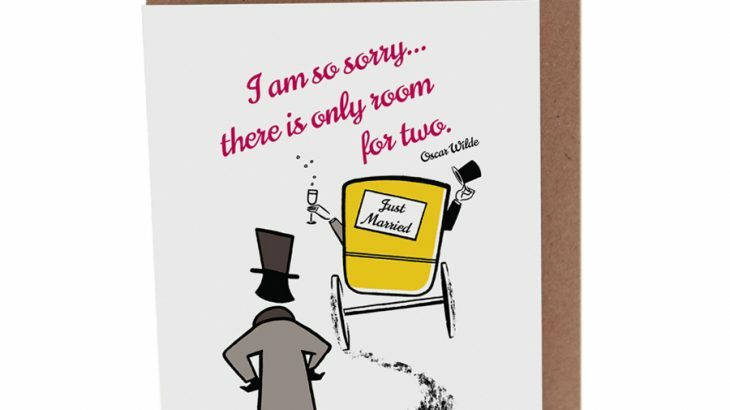 In the end we decided to take out the back window of the carriage, replace it with a ‘Just Married’ sign and suggest the characters with arm gestures, holding up a glass of champagne and waving a top hat. We also removed the carriage driver as it was getting too crowded and finally tilted the carriage to suggest movement and a sense of frivolity for a wedding. The Making of the Wilde Wedding Card by At it Again! The final part of the puzzle was the colour palette. Each of our pocket guides to Irish literature has a colour that ties-in with the original books, the authors or both and we always try to include the book colour into our cards and prints. After much mixing of paints we added pink for the quote to the yellow of Romping through Dorian Gray for the carriage to direct the eye to the happy couple. After trying on new compositions and colours and discarding many others, we are really happy with our new Wilde Wedding Card and hope that we have added some colour to the wedding scene. Happy Pride 2018! Oscar Wilde, The Picture of Dorian Gray. permalink.